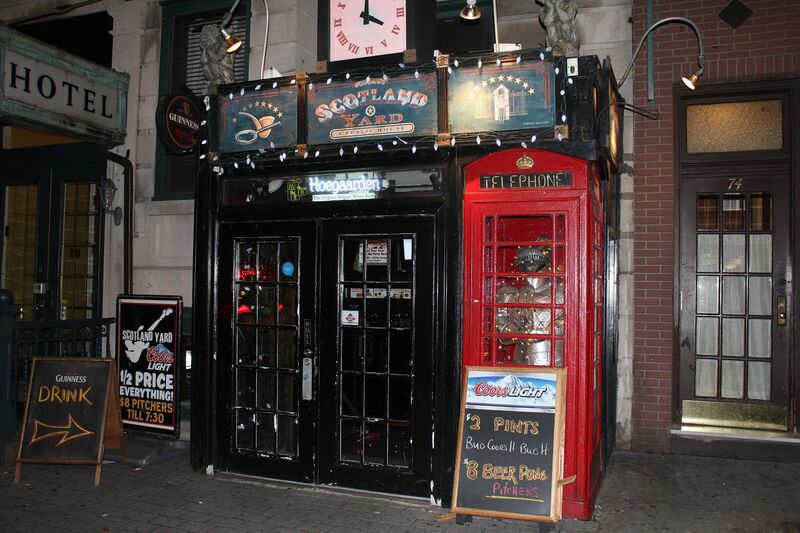 Like clockwork, seemingly each time we walk past Scotland Yard either to or from the Path station, we consider for a moment sticking our head inside to check out that evening’s live music. And like clockwork, we decide we’re either too tired or too bombed to actually take the couple of steps downstairs into the bar and instead continue on our way. Writing this column has been beneficial for a multitude of reasons, but perhaps the most positive part of the experience is the fact that it gives me an excuse to check out bars all over the neighborhood that I hadn’t been to otherwise. Scotland Yard, just steps from the Path, can now be checked off of my to-do list. If you’ve been following my column closely the past few weeks, you’ve undoubtedly noticed the fact that I’ve been stopping into bars on relatively quiet nights- Wednesdays most often. While Manhattan rages Wednesday through Sunday, the Square Mile simply doesn’t follow suit. At least, not this early in the evening. As such, Scotland Yard was eerily quiet on this night. But even inside, the orange and blue was on every screen, and the only topic of conversation was the ‘Linsanity’ surrounding the New York Knicks. There would be no band performing, not at this early hour anyway, but the friendly bartenders gave us a solid feel of what the place is about. 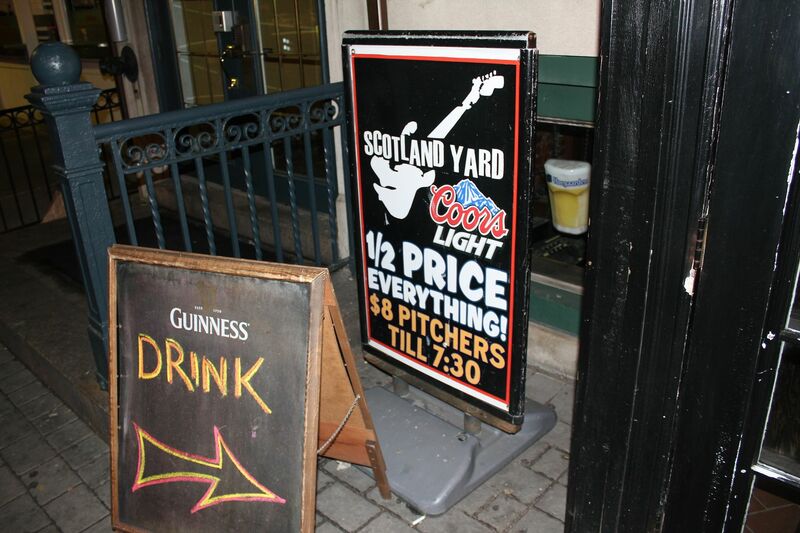 Scotland Yard, the bar, is a locals spot, which doubles as a quick haunt for commuters, with the train station so close by. 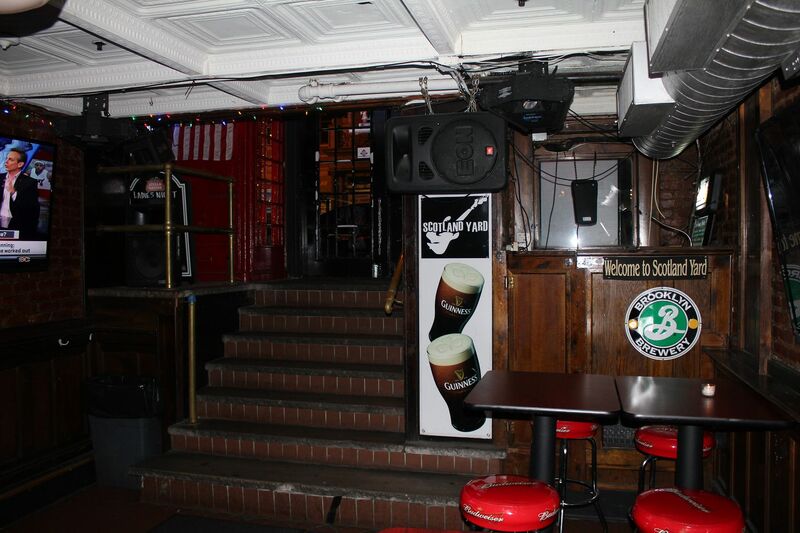 Inside, there are two weathered bars which make up much of the place’s odd interior shape. 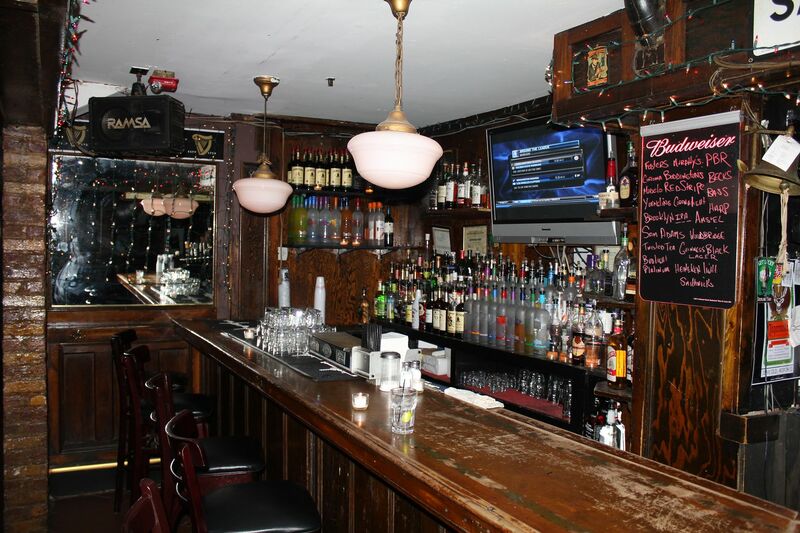 The exposed brick takes a break for the traditional bar flare and the dartboard, and the requisite flat screen televisions everywhere, including right at the front door, before you even get inside. The space is lit by a combination of Christmas lights and tea candles which illuminate the many liquors behind the main bar area- highlighting the entire half priced bar from Monday to Friday. 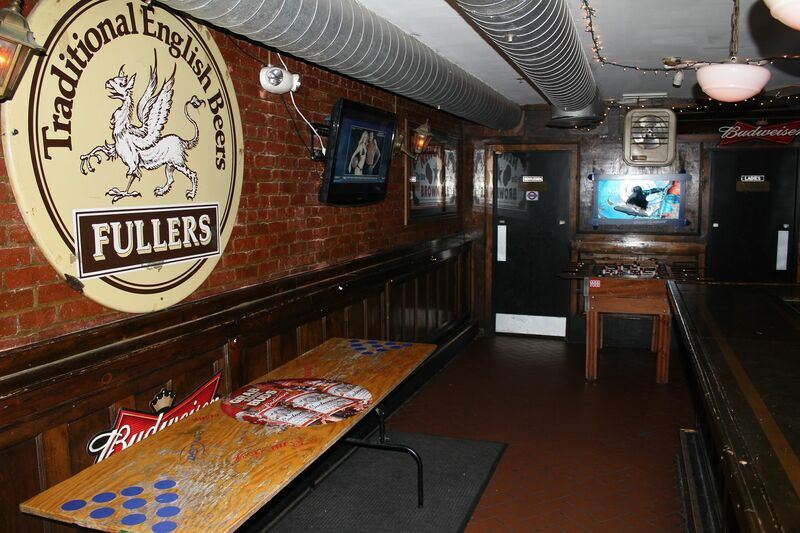 The back area sports a second bar, with some high top tables, and beer pong and foosball tables near the restrooms. 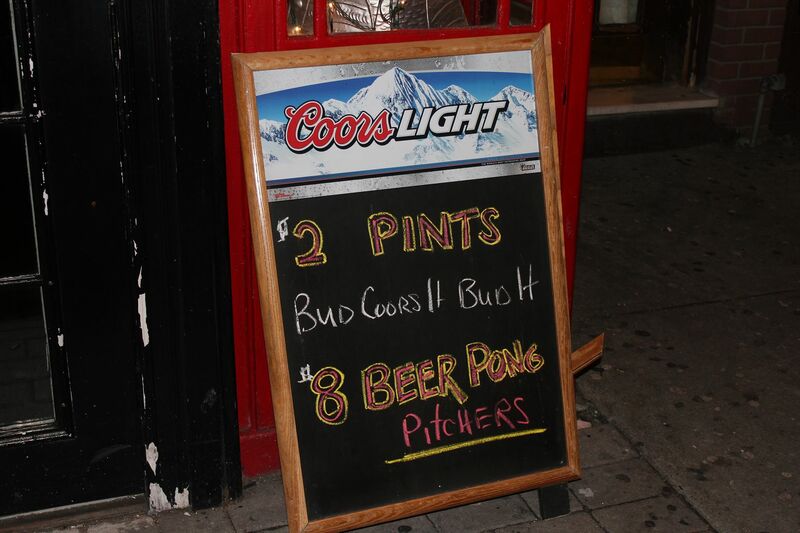 Aside from the half priced bar, $2 draughts and $5 bomb shots accentuate the terrific prices here, even though much of the bar was empty post-work. Date – If your date is into booze and bars and wants you to save money and doesn’t care where you take her… who are we kidding. Don’t bring a date here. Unless she’s your wife and she’s stuck with you. Hookup – Look, I’ve seen people hookup on the street before randomly so I’m not saying it’s impossible. I’m just saying it’s improbable. Catch up with a friend – Good as it gets for this. First or last drink of the night – Check that- good as it gets for THIS. Overall – There’s just something charming about Scotland Yard. The outside which resembles a phone booth. The fact that it’s downstairs in a proverbial basement. The insane price points. The bar games and live rock music. Put all of that together and everyone you know can find something that they like here. That’s notwithstanding the fact that they serve Lucky’s Burgers and it’s a great place to go if you get shut out of trendy Green Rock. With Hobson’s Choice shuttering across the street, it’s nice to know that Scotland Yard keeps it real with an old, dive bar feel as the surrounding area becomes increasingly gentrified. It gets a 7.9 from this humble drinker.